Cropped top illusion dress—very Boho chic and non-traditional without being tacky or dated. 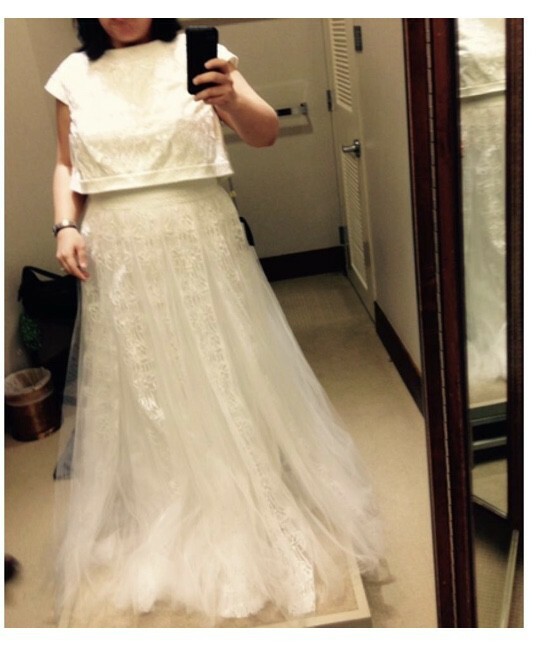 This is a Tadashi Shoji Dress bought from Neiman Marcus. Unfortantely there are no tags. It is a cropped top with a full A line tulle skirt. Measurements are 49 inches from waist, shoulder to waist is 16 inches. Waist across is 18 inches approximately (36 inches across). The full description can be found at http://www.tadashishoji.com/api2163l-ivory-embroidered-tulle-crop-top-full-skirt-gown.